Surviving infidelity is just the first step. You want to do more than survive...you want more than just a heartbeat. You want to know how to either continue in your relationship, or how to move on and leave the broken one behind. Either way, whether you stay or go, taking good care of your mental and emotional health is key to making it through this difficult time. So, following your partner's unfaithfulness, you have a decision to make. Do you stay in the relationship and try to heal and make it work, or do you move on and get a clean start with someone else? Let's explore some ways to answer this important question. Ok, the infidelity has happened. Hearts are broken, betrayal is felt, anger has been expressed, and now the question is, "Where do we go from here?" It's not usually both people asking this, but it could either be the victim of betrayal or the one who was unfaithful. Most relationships don't survive infidelity, but people can, and so can you. So, let's get some pointers about deciding whether to end it or keep trying. Both of you really want to. You have to be highly motivated, because the challenges after infidelity are tremendous, and require a full commitment by both partners. If the person who was unfaithful is showing total remorse for their actions, and expressing deep empathy and compassion for their partner's pain. If the person who was the victim of infidelity is able to manage and control their suspicions. The relationship and the individuals cannot heal if there is constant doubt and suspicion, checking phone logs, monitoring emails, etc. So you can see what I mean. Surviving infidelity and staying together is not easy, even in the best circumstances. It takes two brave and strong souls to get through this business of surviving infidelity. There is any indication that the infidelity is continuing. The healing cannot begin when the wounding is continuing. The partners cannot communicate and are unwilling to get counseling to heal their relationship. The unfaithful person is unwilling to get individual help to identify the underlying issues that caused them to be unfaithful. Clearly, there is nothing easy about any of this. But the more aware and intentional you are about how you respond to this kind of pain in your life, the more quickly you will recover and be able to move on to create a good life for yourself. Remember, you're not just surviving infidelity, you're going to learn to thrive, and create lasting, fulfilling relationships going forward. Okay, you've decided to stay in the relationship, and you want to be able to trust your partner again. And it's hard, of course. But you can't afford to just give in to distrust. 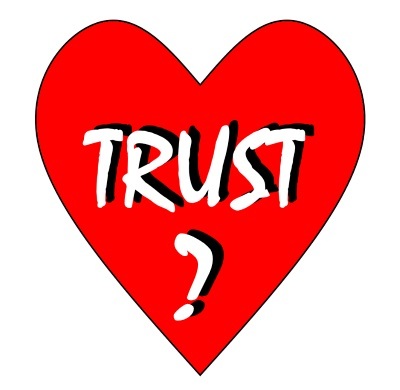 Distrust can turn into suspicion, doubt and anger, and it will destroy any chance of love. But this is your choice, and with enough love and commitment, you can succeed. Let's look at some steps you can take to start rebuilding trust. Trust begins with you trusting yourself. This is because if you put your trust entirely in another person, you're giving them too much power over you. Here's how it works...you trust yourself to make good decisions about your relationship. If your partner is truly committed and loyal, they will prove that to you over time, and if not, you'll know that as well. Trust is a daily, ongoing practice. You have to decide again and again to trust yourself and your perceptions, but you also have to try your best to stay positive about your partner. The idea is to assume the best of your partner. Why? Because if you don't, you'll go straight into a fear-driven tailspin of suspicion. If your partner screws up, you'll know it, and you'll know when it's time to stop forgiving and move on. It's impossible for you not to watch your partner when surviving infidelity, and to some extent monitor her/his behavior. The point here is to remember to also focus on yourself in a positive way. That will balance you, and keep you from getting sucked into suspicion. 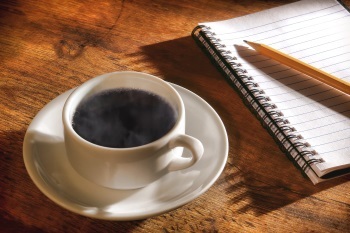 Get more help and support from these surviving infidelity forums. How Do You Heal After It's Over? So, you've decided to end it. And you've discovered that you're walking away with the damage...the pain, resentment, anger and suspicion. Avoid the rebound. If you're too quick to jump back into a relationship, you'll probably find more heartache coming. While a new romance might feel like just the ticket to soothe your wounded soul, it is very unlikely to work out if you're still fresh out of surviving infidelity. Do your emotional healing. Whether you realize it or not, you are wounded from that relationship. And part of that is self doubt...after all, you chose that person that cheated on you, right? It's hard to trust yourself going forward, and the more you progress in your emotional healing, the easier it will be to trust yourself, and the more likely that you will make good choices. Look for examples of the kind of relationship you want. If you can't find any healthy relationships among friends and family, then keep looking until you do. You're very unlikely to be able to create something you've never seen or experienced. When you do find a good, healthy, balanced relationship based on respect, love and mutual autonomy, observe closely. That' what you want. Develop your self love. Part of the goal here is to love yourself enough that you will only accept the best in your relationships. 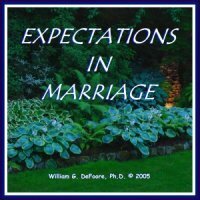 Journal about and visualize your new relationship. This is like pre-paving the path to where you want to go. In your journaling, write about all of the things you want in your new relationship, and how you will feel and respond when you have it. Then visualize it clearly in your mind, savoring and enjoying all of the good feelings of loving and being loved. Don't be confused about "falling in love." You don't want to fall into anything...try walking in with your eyes and ears open, paying attention, and taking very good care of yourself. Now you have either learned to trust again in your healing relationship, or you have done enough emotional healing to begin moving toward a new relationship. 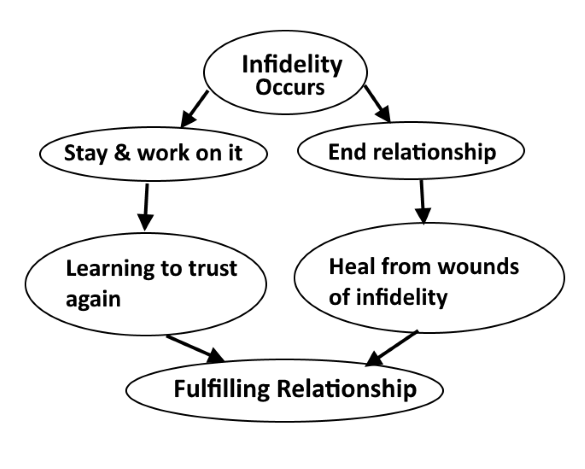 Whether you stayed or left the relationship as a part of your strategy for surviving infidelity, you definitely want a healthy, fulfilling relationship going forward. The best place to start is to start getting clear about your expectations. Ideally, this would be something you and your partner could do together, especially if you're starting a new relationship.